The Revolutionary Connected Food Platform Innit is led by two Mexican professionals, both named Eugenio, with big dreams and big ambitions aimed to help people eat and live better. This Silicon Valley-based startup has created an entire first-class kitchen experience that goes from choosing the right ingredients and creating a recipe considering specific food allergies or special needs, to helping you prepare the meal while better leveraging your cooking appliances. With technology advancing on a consistent basis, companies are innovating different ways they can adapt to this “Millennial Change.” One company that has gone above and beyond to meet those challenges is Innit. Innit is in company terms, a “culinary GPS” that shapes the way consumers plan, shop, prepare and cook their meals. “Innit started looking for how we could leverage technology to empower consumers to make the right choices and easily prepare and cook food every day,” Innit Founder Eugenio Minvielle said. The company defines itself with the type of impact they hope to make for their customers to eat and live better. Everything in terms of choosing, cooking and preparing food is now personalized at the fingertips of each user. With Innit, customers can search the best products needed for the right meal and correctly engage the type of appliance that is required to make their life easier and enjoy dinner with their friends and family. “One of the most stressful everyday questions for people is - What’s for dinner? We aim to solve the critical pain points faced when addressing this,” Minvielle said. The ability to personalize and match products to what is best for each of us, while simplifying cooking, gives people more time to share and eat together at home. “Our platform works end to end throughout the food journey, allowing shoppers to easily plan meals, select the best products based on personalized nutrition, access step-by-step video instructions, and receive tailored assistance with each cooking appliance,” Innit’s CFO Eugenio García said. “It is difficult for many families to put healthy and delicious meals together, but with Innit they will have the confidence to cook every day,” he complemented. Minvielle and García were both born and raised in Mexico and have used their experiences from major industries to help start Innit. Both individuals came from companies that were branched in Europe and Mexico. During his corporate career, Minvielle held top positions as CEO of Nestlé in Mexico, France (as seen in our interviews in Latino Leaders on Nov 2008 and Líderes Mexicanos in March 2009 ) and Unilever in North America. Minvielle founded Innit in 2013 with Kevin Brown (Innit’s CEO) a consolidated Silicon Valley entrepreneur and among other major achievements Minvielle has built an intellectual property portfolio with over 30 patents and 500 claims granted to date. Eugenio García joined Innit in 2014 and is an experienced consultant, banker and executive for companies such as McKinsey, Banco Walmart and redIT stationed in Mexico. Eugenio Minvielle (left): Worked as President and CEO for companies like Unilever in North America and Nestlé in Venezuela, Mexico and France. He is the President of Innit which he founded with Kevin Brown in 2013. 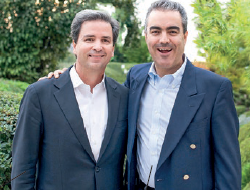 Eugenio Garcia (right): Was CFO of redIT and Grupo Convermex before joining Innit.